Justin Gatlin's agent Renaldo Nehemiah says the sprinter will always be tainted by his doping past. 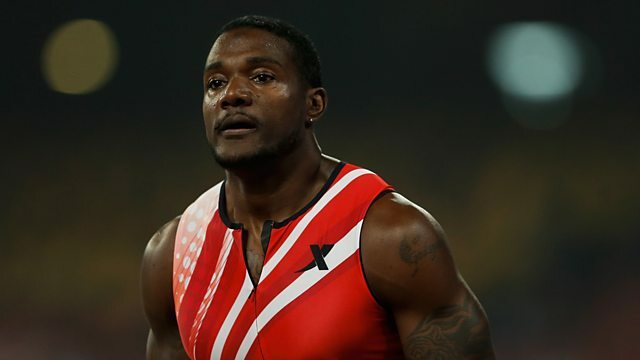 Justin Gatlin's agent Renaldo Nehemiah says the sprinter will always be tainted by doping. The 2004 Olympic 100m gold medallist and double sprint world champion in 2005 was was banned for four years from 2006 to 2010 after being found guilty of using a banned substance. Nehemiah told 5 live Sport: “Justin would have run these times, and faster, had his over-zealous coach Trevor Graham not tried to get him there sooner than he would’ve naturally gotten there. So, what Justin is doing right now, I’m not surprised by that." Nehemiah, one of the great sprint hurdlers in his younger days as well as a wide receiver for the San Francisco 49ers, said: “You can do a study - I always say that if you have an argument you can find any panel of experts to support that argument, and then I can find a panel to dispute it, I’m sure." This clip is from 5 live Sport on Tuesday 7 October.